No Thoroughfare Canyon is located in the Colorado National Monument near Grand Junction, Colorado. Beginning in the Devil's Kitchen area the trail heads up the long rugged canyon where it enters a gorge carved out of the black precambrian granite. Around the 1 mile point from the trailhead the trail comes to the First Pool which lies at the base of a small spillover. Near the 1.5 mile point the trail comes to the First Waterfall where the seasonal stream plunges over a towering precipitous cliff forming another inviting pool of water that collects at its base. Just before reaching the Second Waterfall 1 mile later the trail climbs up a ravine to get out of its granite basement and continues up the canyon for another 4 miles or so, bordered on one side by the towering red sandstone cliffs that create a wall on one side of the trail and the deep wash, choked with cottonwood trees and a thick growth of willows, that forms the main channel of the canyon on the other side. As the trail comes to an end it climbs out of the canyon on a well constructed path to the upper trailhead that is located along Little Park Road. For this post we parked a vehicle at the upper trailhead on Little Park Road after which we were dropped off at the Devil's Kitchen trailhead to begin hiking. Most people that hike the canyon from end to end seem to begin at the upper trailhead and hike in the downhill direction. 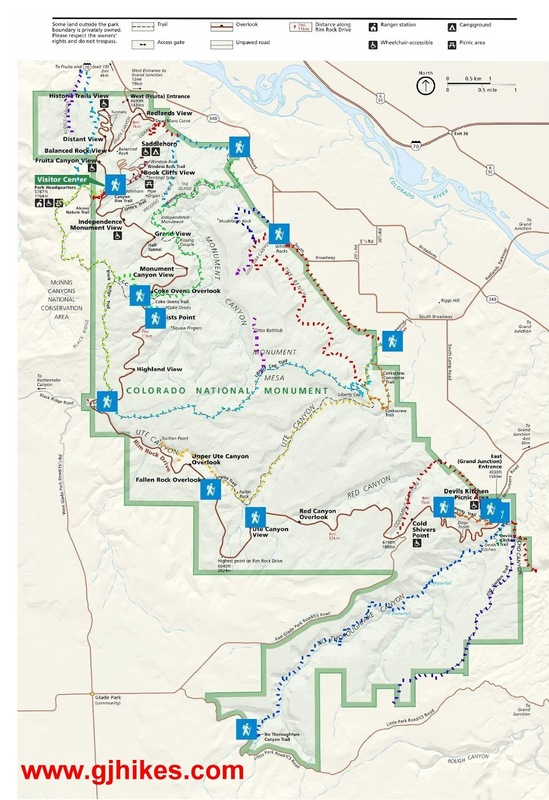 Other than that, hikers that begin at the lower trailhead tend to hike only as far as the First or Second Waterfalls and those that begin at the upper trailhead tend to hike down canyon for a mile or two before turning around. At the bottom of the hill a short distance from the trailhead the Echo Canyon and Old Gordon trails branch off on the left while the No Thoroughfare Canyon turns to the right and begins heading up the canyon. As the trail travels past a rocky outcrop on the right there is the option to scramble up to a small scenic arch that is mostly seclude from view. The cute little arch provides another scenic perspective of the canyon. Just past the arch the trail to Devil's Kitchen branches off on the left. From there the No Thoroughfare Canyon trail enters the wash which becomes the trail for the next several miles. The shady patches of sand and boulders provide a peaceful setting for quiet repose in the area around the First Pool. To continue on up the canyon hikers are greeted by a long staircase of rounded logs to climb. Those that are 'Colorado fit' should be able to make quick work of the challenge. At the top of the stairs the trail returns to the wash for another mile of mostly easy hiking. There are a few spots that require scrambling over boulders and rocks that can be a bit slick when wet or covered with sand. When the trail arrives at the First Falls there is another shallow pool of water and a cliff that rises like an impassable barrier. In the cold winter months the cliff is a wall of ice that is sometimes popular with ice climbers. To continue up the canyon the trail, which is now much more primitive in nature, makes use of a ledge at the top of a steep talus slope to climb above the falls on its right hand side. The use of hands are required to scramble over a rocky outcrop. Bighorn sheep can be spotted anywhere at times in No Thoroughfare Canyon but these photos where taken near the First Falls where there were 4 or 5 rams browsing on the slopes just above the trail. 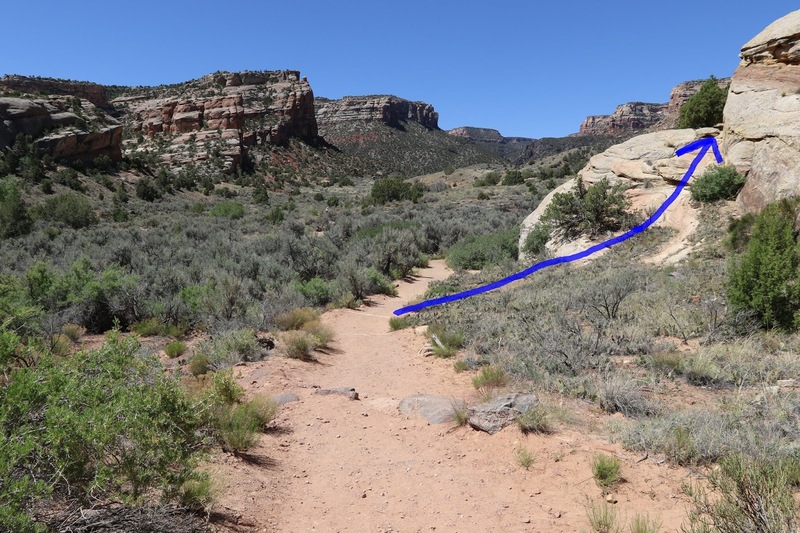 The easiest route out of the canyons gorge is up a side drainage that comes up a short distance before reaching the Second Falls. Easiest in this case is strictly relative as any route out is a challenging undertaking. You can climb straight up the slope following bighorn tracks where there doesn't seem to be any human footprints at all and still come across an occasional cairn or two. Once out of the floor of the canyon the trail enters a whole new world. More and more cairns begin appearing but not at a consistency to make route finding completely easy. The further the trail progresses toward the upper trailhead the more established it becomes until eventually route finding isn't a problem anymore. As the trail continues it crosses a number of different washes, some shallow and others a lot deeper, until it comes to a V-shaped wash a little over a half mile from the trailhead that some might consider to be the crux of the hike. Over the years the sides of the wash seem to just keep getting steeper. This would be a great place for another one of those nice staircases of rounded logs. To get down this bank we resorted to sitting down and treating it like a slide that is so steep you couldn't stop yourself if you wanted to. I suppose it is all part of the adventure which is No Thoroughfare Canyon. After climbing out of the wash there is another secluded arch that is almost impossible to see the opening of from the trail. The arch forms part of the shoulder of the point of cliffs that are right above the V-shaped wash. A semi treacherous scramble is required to get as close to it as we had to get to take this photo. After one more very shallow wash the trail travels through several delightful groves of gambel oaks where the inviting shadows offer a few moments of cooling comfort. 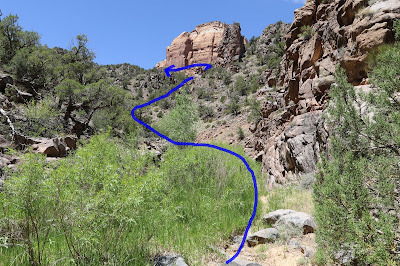 The climb up the well constructed trail that leads the rest of the way out of the canyon is actually one of the easiest parts of the entire hike. The route follows several long sweeps that gently elevate it until it gets near to the rim where it finishes up with stairway of cut stones that probably came from the Monuments own private quarry. Hiking No Thoroughfare Canyon is a strenuous adventure no matter which direction you decide to go. We've always liked the exquisite workout that we get by hiking it in the uphill direction. On the day that we hiked it to take the photos for this post we noticed a group of a half dozen hikers that included a young teenager going in the downhill direction that all seemed to be having a good time of it. We have encountered bears on one other hike in the upper area of the canyon so that is something to be aware of and a good reason to buy you some bear spray. Even though we are showing 'No Camping' at the top of this post backcountry camping is allowed in the upper area of the canyon. You can check with the Rangers at the Visitor Center for more information. Try to camp out of site of the trail as a courtesy to others and pick an existing campsite if you can find one. For all those that enjoy a challenging hike No Thoroughfare Canyon is waiting to be explored. If you would like to see it for yourself then all you have to do is 'Take a hike'.